In the past few weeks, I’ve been reflecting a lot about my life and life in general. As birthdays often stir up a naturally inward-looking assessment of the state of things, I found this year to be no different. What is different is a shift in my world view. I actually wrote this post last week. It was a hard news week and I was struggling a bit. In fact, I didn’t even want to post right away because I wasn’t ready. Then at church on Sunday, Tyler shared about suffering and faith and I left so encouraged I knew I would want to remember. On top of that, yesterday when I saw Ann Voskamp’s post, 5 Truths when you feel tired and the world’s broke your heart a bit, I knew again that there is something right about the timing. Today my day started with thanking God for who He is. If there is nothing else, I hope each day starts like that. I want to say that I have hope and faith and dreams of a brighter tomorrow. But the truth about where I am right now is that I feel pretty beaten down by this world. In some circles they might shout “mid-life crisis!” Others might say I am simply disappointed by reality. I think I am more comfortable with the latter even though the words are exactly the opposite of comfortable. I think in this season, I relate to Solomon’s attitude when he wrote Ecclesiastes 1. Note: I am not comparing my depth of wisdom to his – not by a long shot – but I do think the older I get and the more I experience the brokenness of mankind, his words speak volumes. 12I, the Teacher, was king over Israel in Jerusalem. 13I applied my mind to study and to explore by wisdom all that is done under the heavens. What a heavy burden God has laid on mankind! 14I have seen all the things that are done under the sun; all of them are meaningless, a chasing after the wind. 15What is crooked cannot be straightened; what is lacking cannot be counted. 18For with much wisdom comes much sorrow; the more knowledge, the more grief. I’ve spent the past few weeks wondering how I would dive back into this world of words, wondering what I could possibly have to contribute to all the noise of the internet when it’s all so….noisy. I think of my boys and how I want to encourage them to do great things, to love well and to learn about the deep love Jesus has for us. Yet, I feel this burden of mankind; this knowing, more than ever, that humans get it so wrong so much of the time. Honestly, it’s depressing. I don’t know how to be the joyful parent in these times when planes full of civilians are being shot down and literally stolen from the skies, when unspeakable sadness grips the hearts of parents who lost everything in an instant, when greed and lust and rage seem more powerful than love and grace and forgiveness. How? How can we live like this? How can we overcome day after day after day with no tangible end in sight? 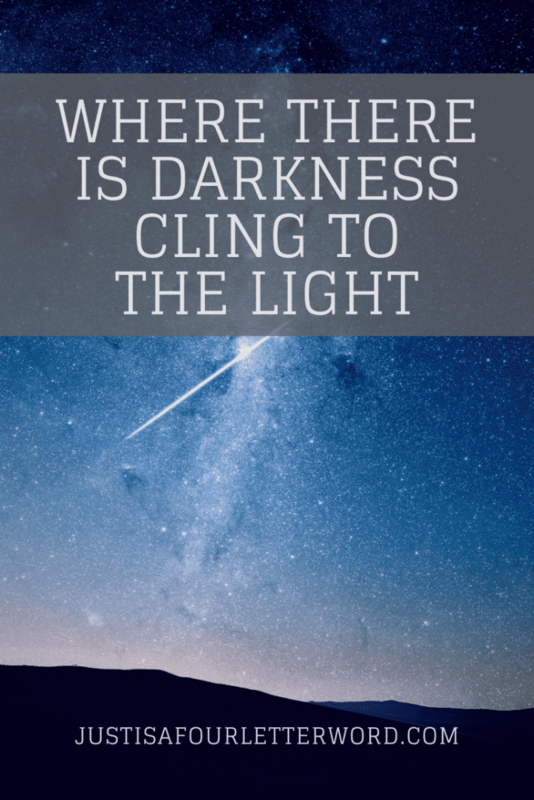 How can we love and dream and live in the light when there is so much darkness? My heart knows the answer. It’s the response that makes me say “yeah, yeah, yeah” almost every time. I am sure partly because it is too simple, partly because I can’t physically do it, and partly because my heart still doesn’t fully believe we shouldn’t have to atone for our own sins. 22Cast your burden upon the LORD and He will sustain you; He will never allow the righteous to be shaken. Peter believed it when he encouraged the church in 1 Peter 5. 7Cast all your anxiety on him because he cares for you. Here and even at this moment I don’t know how to do this. I dare not compare myself to those who appear to have it all figured out, because I don’t know what keeps them up at night. They may be going through the same thoughts over and over and over and I just don’t see it. I know what keeps me awake though, and it is a profound searching for answers. I am about to send my oldest son off to Kindergarten and I am terrified. I am so proud of him and so excited for this next step, while at the same time feeling completely useless to prepare him. I am a dreamer, the eternal optimist, yet here I am tapped out and stunned into sadness by what I read and see on the news. Completely numb and unable to fix the brokenness, I mindlessly take my seat next to the rest of humanity, watching it all burn to the ground. In my lifetime there have been wars and conflicts and death and destruction and brokenness and pain. This has been as constant as the love and healing and forgiveness and restoration is right around the corner. I’ve seen the bright sun too. I know its warmth and the comfort of security. I know that good wins in the end and that this is what David and Peter knew. I know it. I need to feel it. It’s seasons like this where what I feel is darkness. It’s when I know I need to cling to the light, any light. I am clinging and I am writing about it because try as I might to imagine a brighter, happier future for my children, I know better. I know they will face impossible questions and wonder just what the point of it all is. I want them to know that I have asked these very same questions. I still ask them and I will ask them again. There will be seasons of feast and of famine and one is not more blessed than the other. One is not the result of right or wrong. Sure there are natural consequences for our actions. But many seasons are just that, seasons. When there is darkness, I pray they will cling to the light because some days that is everything. Some days, it is the only thing. I often feel mired by the weight of the world’s ills too, but the light of children and their silly antics and funny outbursts give me perspective. It’s truly the little things that keep me from bursting under the pressure of the big things. My oldest is off to middle school in a few weeks, and I have the same feelings I had when he started kindergarten. Color me emotional. Hang in there! You know I could have written this. That’s how much I found myself nodding along. Truly some days it is the only thing I can do to not be crushed under the weight of all that is dark in the world, all that is going wrong, and that never-ending feeling of not doing ‘enough’ (as if we could ever do enough in one lifetime!). What a lovely, poignant post. So happy to have stumbled upon it.